Hi, a few comments regarding methodology. First, a one-tailed test seems appropriate given that the hypothesis didn’t just predict a difference, it predicted the direction of the difference. Second, a marginal p value is marginal, and one should not try to invent rules for turning it into a definite yes or definite no. Third, introducing a “stop rule” is the worst possible response to this sort of thing. The more mixed-up the evidence, the greater the need for additional evidence. The only viable “stop rule” is that experiments may cease when the understanding is so thoroughly settled that a single additional experiment will not have any impact on it. Bill: Thanks for the thoughts. There are certainly instances when one-tailed p values are appropriate. In the case of the Kosfeld paper, it would have been if the researchers only cared whether OT caused /increases/ in trust and if they were unwilling to permit their data to be informative about the opposite possibility–that OT causes /decreases/ in trust. In social science, where the links between theory and predictions are typically quite loose, it is often difficult to generate a prediction so ironclad that one is justified in ignoring one tail. 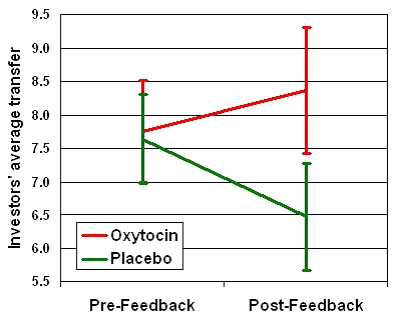 But would the authors of the Kosfeld paper have ignored the finding that OT seemed to reduce trust? It’s conceivable; if so, their choice to use a one-tailed test was a defensible one. Of course you’re right that we throw away valuable information by using p values to generate binary yes/no decisions. That’s always the case, but if there’s anything we’ve learned from the replication crisis in social science, it’s that p < .05 is probably far too liberal to protect us from false discoveries anyway. Your point about stop rules strikes a similar chord. Strength of evidence for a given hypothesis is a continuous quantity, but at the end of the day, we need some guidance on what to believe given the data. I think the Bayes factor, which provides a ratio of the likelihood of the alternative hypothesis given the data divided by the likelihood of the null hypothesis given the data, is probably our best way forward in using social science data to draw inferences about how the world works. As the Bayes factor increases, inferences that the alternative hypothesis is correct are strengthened, even though there is still no bright line given that we can use for making real yes/no decisions. Actually the point I was trying to make is sort of the opposite — not that using p values to generate binary decisions throws away information, but rather that it creates spurious information. A p value of 0.05 is so weak that it usually contains much less than one bit of information. Treating it as a binary threshold artificially increases that to a full bit. It inflates the meaning of the evidence. I personally think it was a mistake for the field to set 0.05 as the working threshold for publishability, and that using 0.01 would give us a substantially more robust literature. I agree with you, Bill. If one goes further and combines the practice of insisting on smaller p values (perhaps even .005 or .001) with the practice of obtaining much larger samples than what we have become accustomed to finding acceptable, the robustness of our literatures will improve. Or, even better, we could do away with NHST entirely and focus on confidence intervals and Bayes factors. Hi Bill, thank you for this important post! 1. A failure to get a significant p value (p<0.05) is not necessarily a failure to replicate. The results are many times consistent with both the hypothesis and the null. (See for example this recent discussion in the behavioral econ community, published by very serious people: http://papers.ssrn.com/sol3/papers.cfm?abstract_id=2351926 ). In the "failiure" of replication 1, for example, the effect directions seems to be in the right way, and the error bars are pretty big. I did not check the numeric values, but this "null" effect seems to not be able to reject the 17% increase "hypothesis". 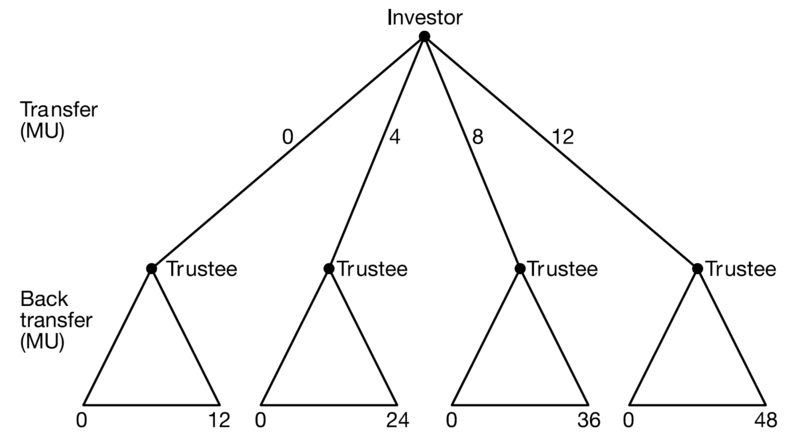 Regarding studies 3 and 4, I haven't looked at the direction of the interactions, but there could be the same confound — I especially suspect that because of the smaller size of participant groups compared to the Kosfeld paper (approaching a half of the subjects). No one would claim that if we ran this study with 10 subjects alone and fail to get p<0.05 this would be a meaningful evidence, right? 2. It is important to control for possible other confounding factors, such as general risk attitude, that may increase "trust" behavior. This was properly done in the Kosfeld study, and the paper seems especially convincing because of that. I'm not sure if it was done in the rest of the papers. Dear Gidi: Thanks for your comment. With only six studies in this area, it might look science-y to do a meta-analysis, but there are so many ways in which the six studies I wrote about differ from the others that it would be difficult to derive truly comparable effect size and standard error estimates. They’re probably not estimating a single population parameter, so I went with a narrative approach to reviewing the studies instead. 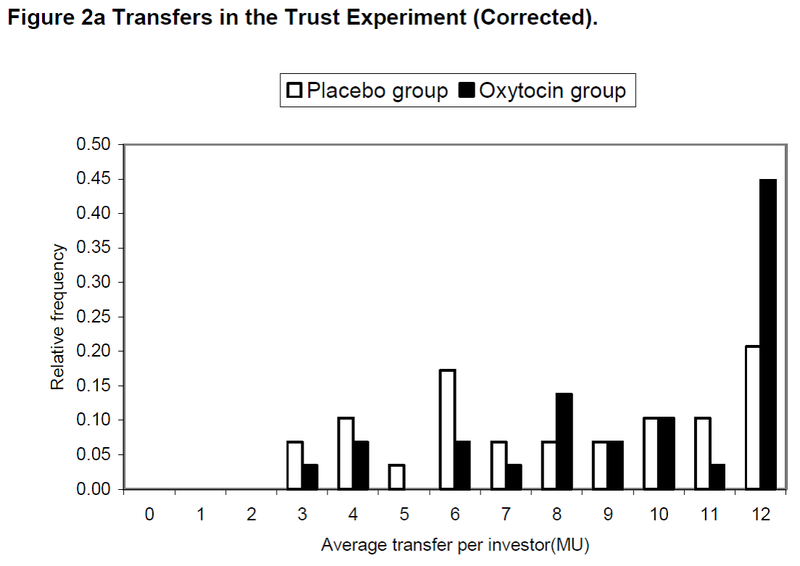 Once you’ve proven that the effect of oxytocin on trust game behavior is different from its effect on general non-social risk-taking (assuming it has any effects on trust game behavior at all), I see no reason to continue to rule out that alternative interpretation in each new study. Once an alternative explanation has been ruled out (killed), we don’t need to keep digging it up over and over so that we can kill it again and again. “I also remain unconvinced that intranasally administered OT even makes it into the human brain in the first place” – do you have any papers in mind that have examined this? Thanks for your note, Moïra: It is good that you are trying to publish your replication! It is still hard to get replications published, but really good for the field. Would love to see it when you have a draft that you are comfortable circulating. Have you written/heard of anything further about OT with regards to the BBB? I’ve spoken to a number of neuropharmacologists who share your doubts about whether intranasal OT can enter the brain. It seems, however, that researchers in this field are hedging their bets A) on the possibility that intranasal administration bypasses the BBB (I believe there is some experimental evidence by which we might buy this proposition as it pertains to other drugs/hormones) and B) that intranasal OT in rats/mice seems to increase brain levels after about an hour. Is there any evidence for or against intranasal OT entering the brain in humans? Nick–There seems to be some decent evidence that intranasally administered OT makes it into the noses of rats, and some mixed evidence that it makes it into the CSF of macaques, but human noses are quite different from rat noses, and I think the macaque data are not as strong as I’d personally prefer.